What started out as seven grocery bags full of apples to trip over in our kitchen is now down to only three grocery bags full of apples to trip over. We’ve shared some (meaning we’ve begged people to take some off of our hands), made applesauce, dried apple rings and now apple pie filling. Oh yeah, and we’ve eaten a bunch. This was my first time to try canning apple pie filling and I am pleased with the results. It’s a little time consuming to make, but it isn’t hard. Will the hard work be worth it in February when I make a quick Whole Wheat Pie Crust, pour out the contents of the jar and bake a pie? Oh yes, I think so. a nice little syrup has formed and your apples are slightly tender. Scoop apple pie filling into sterilized canning jars. Hot water bath the pie filling for 25 minutes. 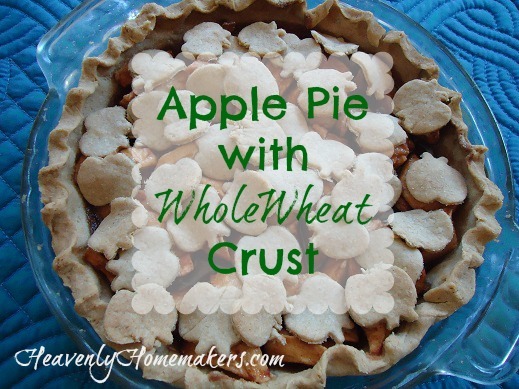 Prepare this Whole Wheat Pie Crust and place it in a pie pan. 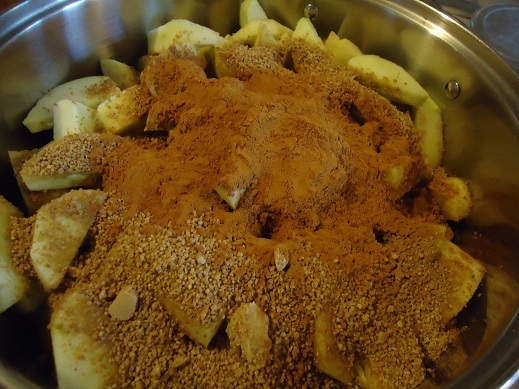 Dump contents of Apple Pie Filling jar into the crust. Use bits of leftover crust to put little cut-outs onto the pie, or make a crumb topping. Bake at 350° for one hour. What kind of apples should I use for this apple pie filling? I would suggest using the kind you get for free. Those taste best in a pie. Otherwise, granny smith makes a really good apple pie. Some of you want to share your favorite apples for pie making? Can I freeze my pie filling? 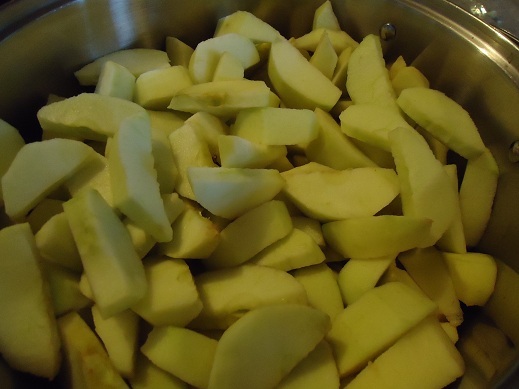 You can certainly freeze this apple pie filling if you’d rather not can it, or if you don’t have canning equipment. I chose to can it because all of my freezers are pretty well full of meat, green beans, corn, strawberries, peaches… Wow God is good! Can I use this apple pie filling to make an apple crisp? WOW…those pictures all looks so delicious. Wish I could reach through the computer and take a bite! YUM. Mmmm! I love Stayman, Winesap, Braeburn, and Jonagold apples make lovely pies. Mmmm it is apple season here in Virginia. In three weeks there will be an apple harvest festival in the mountains. There will be hayrides and applebutter slowcooked in a giant kettle over an open fire. Live bluegrass music, hot apple cider, and apples apples apples. Don’t buy from the roadside vendors, they sell drops to the city slickers who come for the festival. Bring a picnic and stay all day. Come to Virginia in the fall, go to the Blue Ridge Mountains for your vacation. You’ll never regret it. We love the Graves Mountain Apple festival! We’ll be there on the 10th. It’s amazing hte deal you can get on the apples. Last year I think it was something like $10 for a huge box! Where is the best (cheapest) place to find canning jars and other supplies. Just found your post on canning and preserving and what to look for at garage sales. LThanks. One way we cut down on time is with an apple peeler corer. It core peels and slices apples into a long ring all at the same time. We do not have a lot of gadgets around the house, but this was well worth it. With practice we can peel about 5 apples a minute. It would be something the boys could help with. My grandpa, who never cooks, insists on peeling apple for my grandma because it is so fun. It is also good for apples with tough skin to peel. I have one of those too, but something is jammed on it and I can’t get it working right again. SO sad because you’re right…it DOES cut down on time and is a lot of fun to work with. SO cute that your grandpa does that for your grandma!!! Thanks for posting this. I was given a good many apples by my aunt and uncle this fall. I was unsure how to do the homemade pie filling, so I made 3 pies and froze 2 of them. I did make some applesauce, and just froze the rest, sliced. If I find a good buy on some more, or if I have some more given to me, I may try canning the pie filling. So funny! I just got on the computer to look for a canned apple pie recipe! For Christmas each year, we prepare baskets of our canned goods/homemade items for our family. I thought this year I would make an “apple pie” basket with a dough mix, apple pie, and cinnamon sticks or maybe an apple cookie cutter! It’s so fun :) Thanks for the recipe. I am sure my family will love it! I am going to do the same thing with our friends/family/neighbors!! I’ve got to find a good crust recipe though. I think I’ll mix up the dry ingredients and they can add the wet themselves. Our local orchard makes some fabulous pies and they use 1 Golden Delicious for every 3 Jonathans! So yummy! I was wondering if when freezing the pie filling,can u just put it in gallon freezer bags? Yes, I’d actually do quart sized bags as a gallon sized bag is too big for one pie…unless of course you’re making more than one pie at once…or one big apple crisp! I make my apple pie filling and freeze it… line your pie pan with foil (use a piece that’s bigger than the pan and just tuck it under the pan) then fill it with pie filling. After it is frozen, pop the foil and frozen pie filling out, bring extra foil around top of filling, wrap (I wrap with freezer paper too and label it), and put back into your freezer. You don’t need to defrost before making your pie. A great idea I found a long time ago…somewhere online. Yes please share a recipe for apple crisp! I just spent a lot of time searching for a healthy recipe for apple crisp and ended up making one that wasn’t as wonderful as I hoped for! I just learned that this year! After I froze the filling in pie plates, they fit very nicely in gallon size freezer bags. Have you ever tried fried apples? It’s something my grandma always made. Now I have to make some! Question…..I was excited to track down an orchard to take my kids to pick apples. $.69 a lb!!! I thought that was great. But I did ask if they sprayed. He said they do and they did the beginning of August. I was going to order some organice galas from Azure! YUM! but they were $.99 a lb. I am really wanting to go nuts and can applesauce and now apple pie filling. What would you do Laura? Local orchard, organic from Azure? $.99 a pound for organic apples is a great price, at least where I live! That’s about as low as I’ve ever seen them priced. I just bought 21 pounds at $1.19 per pound. Had to pass up the organic Honeycrisps, which were $2.99 per pound – yikes! That’s a tough call…because I love to support locals and yet I love to eat organic. The local gal I buy from DOES spray, but only a little and only until the fruit sets on. I feel pretty good about getting apples from them because they aren’t just spraying the stink out of their trees. Even organic apples from Azure are sprayed with something. So, if the local apples are sprayed a lot, I’d still go with Azure. Once the canning is done, how long is it good for? I’m thinking it would make a great Christmas gift, along with the pie crust ingredients and maybe a pie plate! Oh, it will definitely last until Christmas – canned items like this are supposed to stay good for at least a year. Sucanat (or rapadura) is defined as “dehydrated cane sugar juice”, which means it is processed less than raw cane sugar. Sucanat isn’t really like traditional brown sugar, but it does bake up the same. For those looking for less expensive options, always, always! Ask about seconds. Seriously. One orchard I’ve gotten fruit from sells seconds that I swear are better than the firsts you find at the grocery store (the orchard ones were handled by one, two people at most – grocery store ones were handled by countless people!). As long as you’ve got a knife, you should be golden with seconds. Heck, we even ask for deer apples/thirds for our cider since it doesn’t really matter at that point *what* the apple looks like. I’d be a little careful using deer apples for cider, unless you plan on pasturizing the cider. Around here, deer apples are typically the ones that fall on the ground. They can’t sell them for human consumption in case they have picked up diseases, bugs, etc. Here the “deer apples” are typically the ones picked, but aren’t near nice enough to look pretty at the market. :) The apples on my unsprayed trees up front have apple maggot issues as well, but we just cut out the bugs (a la 1800’s). Windfall apples are typically the ones found on the ground, and yeah, when you have deer around that poop under the tree if can get dicey. Today I tried to make and can apple butter. Well I didn’t get the apples soft enough to make the puree so when I mixed the rested of the ingredients I canned it for apple pie filling! We will see how it goes! I will definitly be your recipe for gifts. Thank you for posting the recipie! It looks wonderful and since I have 6 bushels(12 brown paper grocery bags full) of apples sitting in my living room. 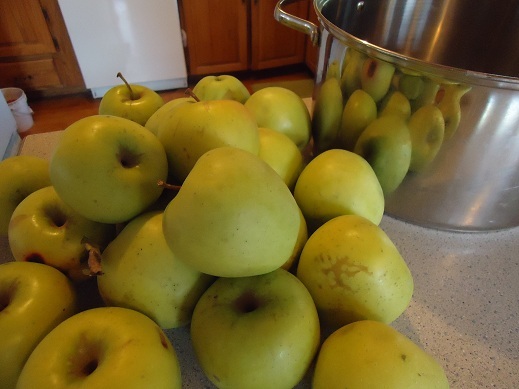 I think I will turn some of them into pie filling, or buy some more for that later, I need at least 5 bushels for the applesauce the way my family eats throught it. Your pictures are giving me modivitation to get started. What do you think about using pears for this recipe? I think we get slightly different varieties of apples up here in Ontario, but I love to make my pies/crisps with Mutsu apples – and the nice bonus is that they store really well in our cold cellar. We just picked 2 bushels of apples at a local orchard yesterday! We have red & golden delicious, empire (yum), ida red, crispin (yum yum), and gala. I’ve been making applesauce and apple butter, but wanted to try canning apples like the ones they serve at Boston Market – do you know those? I was wondering if your pie filling might be close. We have to do gf/cf here – and no one in the family is big on pie, but we did love those Boston Market apples before going gf/cf. Hmmm, we don’t have a Boston Market around here so I have no idea. They sound great though! easy to make into gf/cf. I’ll be sharing it on my blog this week. We’ve made them twice already, once while camping this weekend. I think it will actually can well. Great recipe – thank you! I’m not a canner (although I’d love to be but don’t know how and don’t have the equipment) and would love to freeze this; wondering if you would need to cook the apples a bit longer if only freezing them since they wouldn’t be sitting in a hot bath for a while? Your thoughts? Thanks!! Naw, I don’t think you’d need to cook it longer. I’ve frozen apples raw before (with sucanat and cinnamon). They’ll cook longer when you bake the pie and be just fine! Wow I just did this last weekend! Although the recipe I used is similar there was one major difference. I just put the peeled apple slices in the jar and ladled in the yummy gooie mix! Oh soo good! Laura, thank you so much for this recipe! We just made…oh, 5 batches of it with your favorite apples–the ones you get for free– off my in-laws apple trees. SO GOOD! We’re excited to make it into a couple pies tomorrow! And, the pies we made this afternoon were AMAZING! Thank you so much! This looks SO good! A friend and I plan to make 4 batches tomorrow morning. :) I’m wondering, though, what size are “medium size” apples? Any idea how many cups per quart you used or something like that? If not, I’m sure we’ll figure it out! Since I’m so delayed in getting back to you, I’m assuming you just “figured it out”! I don’t know exactly how many cups per quart…I’m not very good at being exact! Hope yours turned out okay! 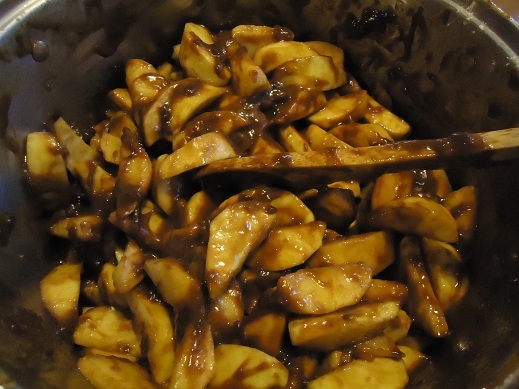 My family got a bushel of Rome apples at a local orchard and I made lots applesauce and two batches of this pie filling. Funny story, my husband went on a business trip the next week and needed to bring an item for a silent auction for a fundraiser. I sent him with a quart of pie filling and a pint of apple sauce in a cute little bag. He told me it sold for $25! It cost me like no more than $3 for those two jars. I just thought I’d share. P.S. i’m loving your site. I will be making my first pie in 72 years and your recipe seems tasty and simple to make. Question #1 What do you mean bye bath the filling in hot water for 25 min ? Cant I just put the filling in the pie crust when the filling is done ? Yes, you can just put your filling into the crust when you’re done, you don’t have to water bath it. That is only a necessary step if you plan to preserve it for shelf life. I use a mandolin to slice my apples. After coring and peeling I can slice an apple in about 10 seconds and each slice is thin and perfect. I’m looking into buying an apple corer and peeler so that I can make some applesauce and some of this yummy looking pie filling. Any recommendations, suggestions? I’ve seen the ones that clamp to the counter by suction, it seems to me they would never hold there suction long enough. Thanks for any help! I like the one from Pampered Chef. Do you know approx. how many pounds your 25 apples are equivalent to? I bought a bag of really large apples at my farmer’s market yesterday and am not sure how many I should use per your recipe measurements. We don’t need a preservative in this to keep it from going bad? Apples have enough acid that they do just fine when properly processed in a water bath. I was wondering how you made the cute apple cut-outs on the pie? Thank you for sharing your wonderful recipes and for your hard work serving the Lord and His Body. They were made with little cookie cutters. So how does the arrowroot powder hold up to the high heat. I haven’t used it alot but have had some gooey situations when I tried cooking it too long. Also what kind of flour would you suggest? We have a corn allergy in the family, so I’m trying to figure out an alternative to cornstarch. I just bought 20 lbs of juice grade gala apples for $10 (What a deal). This is a perfect recipe for them, and for my first try at canning. Going to make them this afternoon. LOVE your adorable pie with the apple cut outs on top, brilliant idea, I am going to steal…er… be inspired by it! how would this recipe be edited to make only 1 filling? i don’t have a lot of money or time but i am making pumpkin pie for thanksgiving for my family and my crust recipe makes 2 pie crusts so i want to try and make an apple pie. Thanks for the recipe. I was wondering if the same recipe would work for making other fruit pie fillings, peach maybe? last year i got a bunch of apples at the farmers market and went ahead and made up a few pies; cooking the filling in my skillet and then pouring them into unbaked crusts and then wrapping the whole thing up nice and tight and put them in the freezer. it worked great! when i wanted a pie, i unwrapped it and put it in the oven on a cookie sheet, still frozen, and baked it for about an hour and a half. made the holidays a little less crazy cuz i had done all the messy/hard stuff a couple months ahead of time! That is what my Grandma did. She did all of her pie that way. They were terrific. Hello Laura, I would like to know, when you can your apple pie filling, how much do you fill up your jars, to 1 in or 1/4in from the top,? from the picture it looks like there is some air bubbles, do you make sure all air is out,? all these steps are done in some canning recipes, so I was wondering what you do. And since your new article about cutting sugar content, I was wondering if we should cut also the brown sugar here. Thanks for your reply, I’ll will wait to make mine until then. 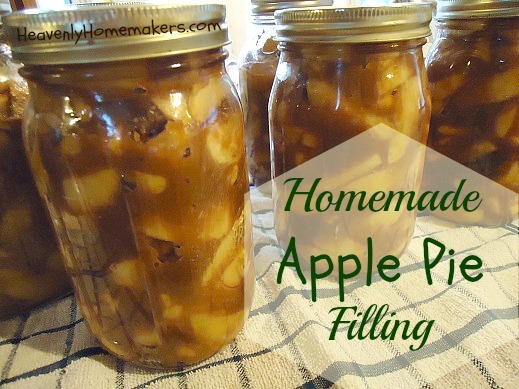 I just finished making your pie filling recipe- it made 4 quarts for me! I’ll be making a pie this weekend! I am anxious to try it out. Thanks for the recipe!